The flowers were certainly crowning the area today, but the snowcapped mountains were firmly grounded in a beautiful blue sky. There was no sign of ‘misty showers’ on this particular day. 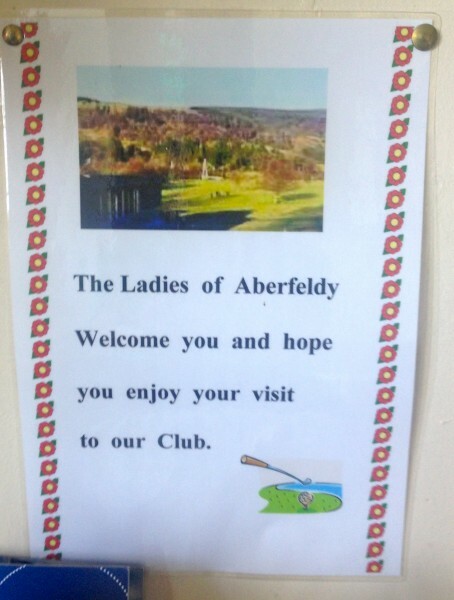 And the Aberfeldy Golf Club, bathed in warm sunshine, welcomed us. There were a few playing already as we made our way to the clubhouse, known affectionately as ‘Never an Old Tin Hut’ after its humble roots as a bicycle shed prior to being the clubhouse it is today. It stands proudly juxtaposed the River Tay and the Course itself. We were warmly welcomed by the Club Manager, Willie, pictured here with me. 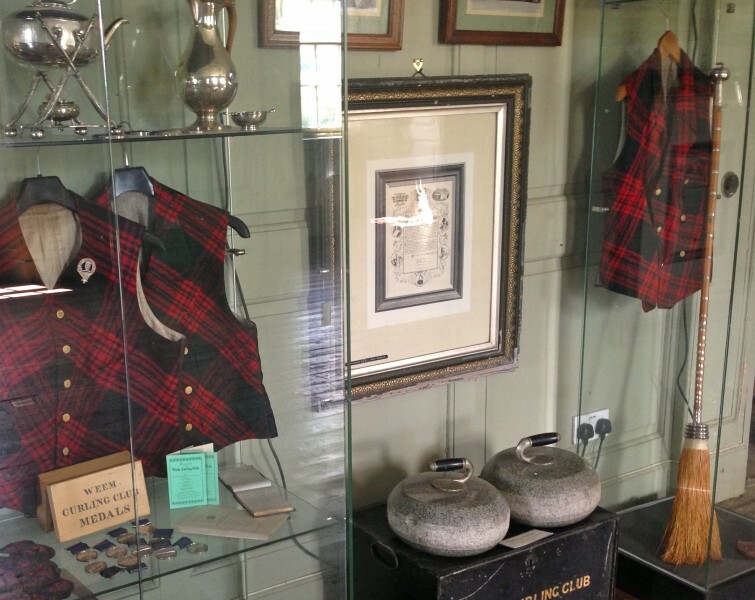 The Aberfeldy Golf Club is celebrating its 120th anniversary this year, and much of its history traces that of Scotland and golf itself. It was founded on land granted by Lord Breadalbane at ‘the curve of the River Tay.’ As the main landowner in the area, Lord Breadalbane gave a 'feu-rent' use of the land for 'sport and recreation' to increase benefits to the common folk. The golf course was to be located on the ‘East and West Cow Parks’.... He acknowledged that would mean that the grazers ‘would not pay the same rent when the grass is being trampled by golfers ….' But magnanimously he adds, that ‘this [is a cost] I am willing to bear.’ It brings new meaning to calling a golf course a ‘cow patch’! But as you can see, the Aberfeldy Golf Club is no cow patch. 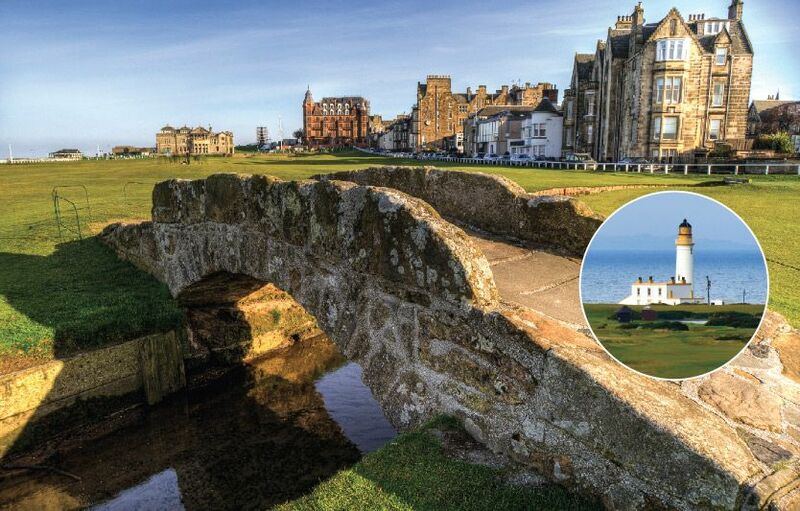 James Braid had a hand in making it the beauty that we see today. 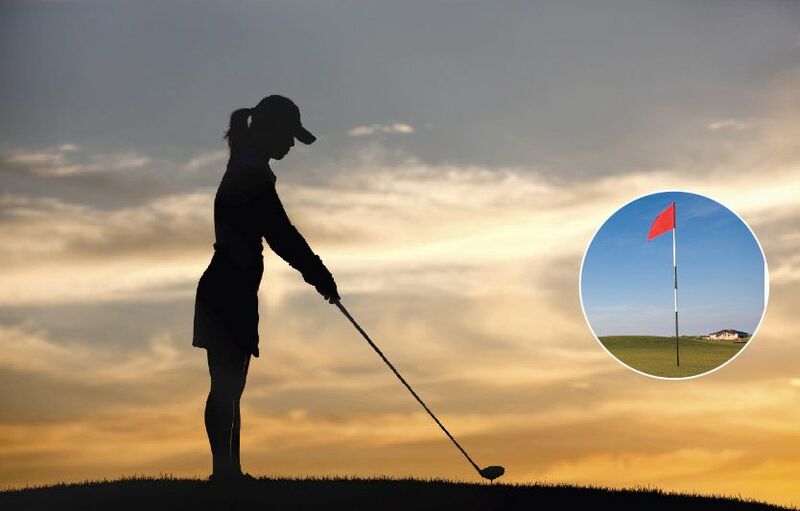 But it is a stern test for a golfer of any ability with punishing rough and challenging long holes juxtaposed to wide open fairways and short par 3's. 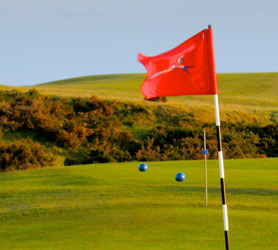 Men and women play from the same tees, the yellows, so there is no quarter given here. Willie said there are roughly 100 playing members with 20 or so being Women and 25 being Juniors. We were delighted to learn that half of the junior members were girls. I am sure they will all learn their craft well here on Aberfeldy! 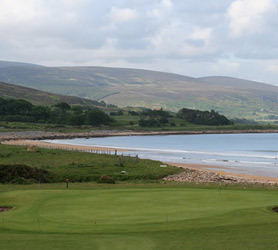 Water is a main feature of the course as it follows the curve of the River Tay. There are many additional water hazards to negotiate, none more so than the lurking burn on this the second and fourteenth. The course crosses the River Tay after five holes, cleverly allowing one to play just 10 instead of the full 18. It seems many local members take advantage of this feature. We were lucky to be following some locals who directed us to continue over the bridge, as they were only playing 10. But what a bridge it is! As you can see, it's easy to understand why it won the 1993 Saltire Civil Engineering Award. 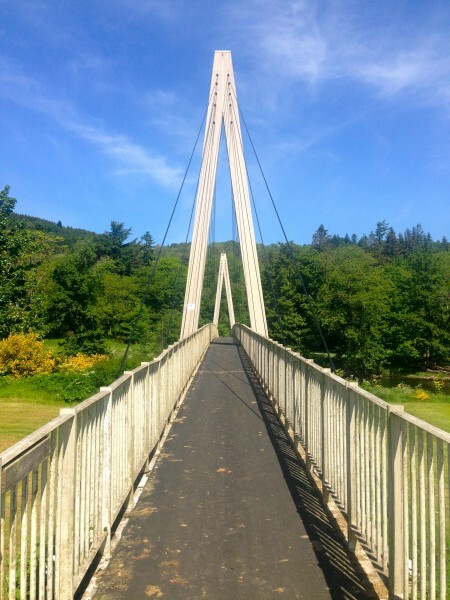 It is reminiscent of the 'Pont de Normandie' and fittingly provides the transfer between the thirteenth hole, the Waterloo, and the 14th, Obair Pheallaidh which is a reference to the original name of Aberfeldy given by Palladius (the 5th century saint sent by the Pope to convert the Scots). But, believe me, by the time you reach the 14th hole, you are converted! The views on the home holes are spectacular. The snowcapped mountains in the distance give a breathtaking backdrop to the clubhouse and General Wade’s own famous bridge over the River Tay. These closing holes have a rare magic. It is as if the optimism of Bonnie Prince Charlie, as he rested in Aberfeldy prior to the Battle of Culloden, can still be felt in the course’s solid ground. It gives one a lift to tackle the unexpected challenge of the finishing holes. And unexpected they are! 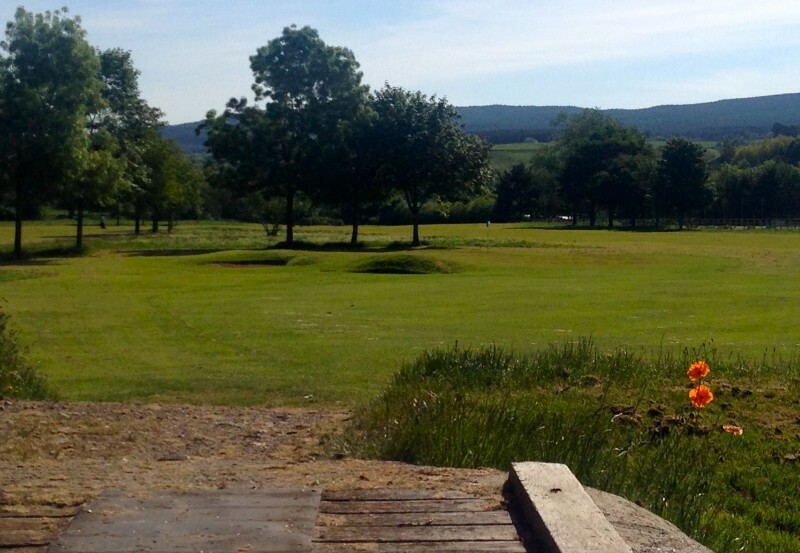 Aberfeldy Golf Club’s 18th is reminiscent of the 17th and 18th of St. Andrews Old Course. One has to pass over a wee road, overcome a ‘bunker of sin’ to reach the tricky green and not go over the back. But be clear: if you are long the cars approaching General Wade’s famous bridge, with its one way traffic system, await. So, just like St. Andrews, the course finishes with a captive audience and accuracy is a must. I am happy to report that this was one place I successfully avoided the hazards. And although I lost plenty of golf balls out on the course, I finished the last five holes with one ball (thanks to Ann finding it on the 17th). It felt like a real triumph. She duly paid her punishment at the Bar in support of the Aberfeldy Junior Golf Programme. And we all had a good laugh. As we enjoyed a cold drink in the clubhouse, I was discussing with Willie which was the course’s “Signature” hole. I personally had really liked the 13th, the Waterloo, which doglegged right to a blind green tucked beautifully beside the River Tay. And with the flash of a wicked smile, he said, "C’mon! I'll show you!!" So off he went, returning with a 20 foot ladder and held it against the clubhouse for me to climb up. Sure enough, there were 8 (nearly new) golf balls on the roof! As I counted them he called up, "And that is just after a couple of days. I cleared a whole lot on Wednesday. You should see it up there when there's a competition on - it's like it has snowed!" We had another great laugh and he said that it helps keep the Junior programme in golf balls. I bet it does!!! So Aberfeldy Golf Club has many unexpected delights. But being so close to the River Tay is not always a blessing. Willie said Robbie Burns got it right when he spoke of the ‘misty showers’ as the showers are plentiful in the Fall and Spring, and the river often floods. The worst was in 1984. 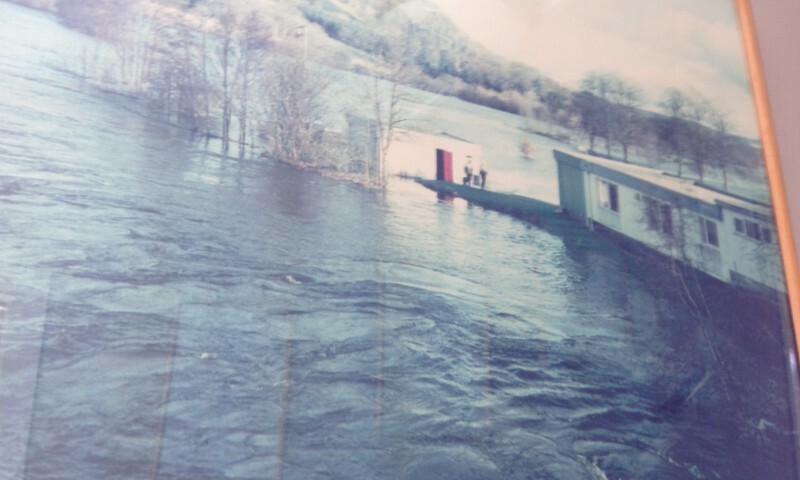 Then, as pictured below, the river flooded the entire course and over ran the club house itself! Here is General Wade's Bridge today, and the black marks give the normal height of the high water mark. Willie kindly gave me a book on the history of the golf club, and it turns out that Aberfeldy Golf Club was officially opened by a woman, Lady Currie of Garth, on June 5, 1895. 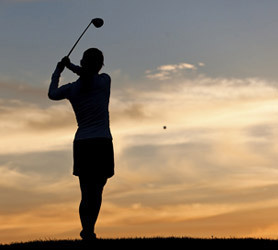 It was she who struck the first shot and golf began on the course. Lady Currie was presented with a silver mounted putter in honour of the occasion. Lucky lady! Now a certain member, Mr. Cameron from South Africa, provided the prize money. Instead of using the funds to buy medals, the committee had the foresight to play for the prize money instead. (Canny Scots these locals are!) And although the gentlemen kept the bulk of the money as a prize for the Men’s event, they chivalrously purchased a ‘Silver Kettle’ to be put up as the Ladies prize. (How thoughtful, just what every Victorian golfing lady needs: a silver kettle.) The record shows that Mrs. K. Macdiarmid won the trophy three times and it duly became her own. Later she magnanimously returned it to the club ‘to be played for annually for all time to come.’(p.26) I shall have to stop in next time I am passing and see Willie to find out who is the current holder of this important honour! I have really enjoyed learning the fascinating history of this club. 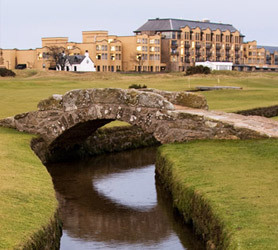 It's given a real insight into how golf in Scotland grew out of a need to ‘play:’ with people sharing two clubs between them, and the caddies working without shoes so as to be able to retrieve golf balls from the water hazards with ease. As the book recounts, Aberfeldy golfers give rise to ‘the Corinthian spirit in which the game is played putting winning second to the pleasure of participation.’ (p.40) I think it is that spirit which pervades the game in Scotland which in turn is why so many people play. 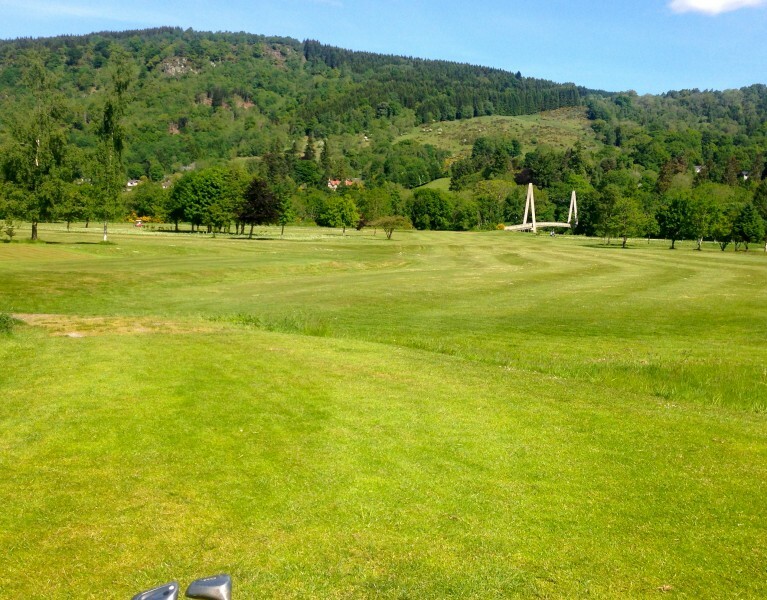 Aberfeldy Golf Club is a genuine diamond on the banks of the River Tay: tough but beautiful, and if you don’t watch out, it will cut you down to size! It certainly did me. But I would highly recommend it to anyone and everyone. 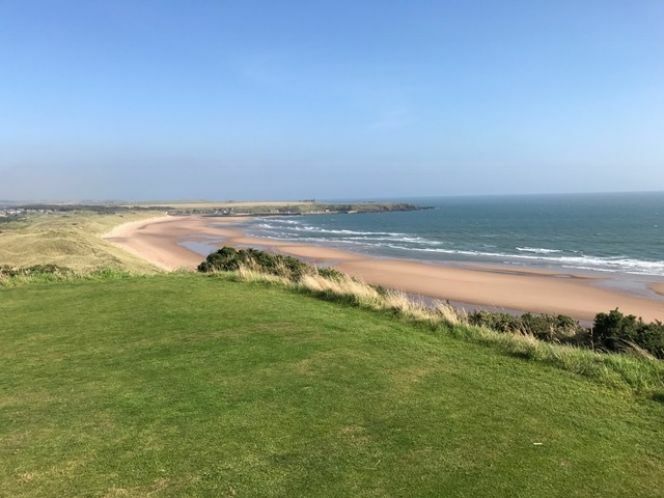 Now one of the great advantages of playing with a friend, (and a lady friend at that) is the ability to enjoy not just the golf, but the other interesting sites in the local area. So after such a lovely morning, we continued our journey to enjoy a wonderful Scottish site: a castle! It is a Z plan castle which basically means it has two towers that are connected in the middle by great halls. Often times one tower is the original part of the house and gets added onto throughout the ages. This is certainly what happened here. 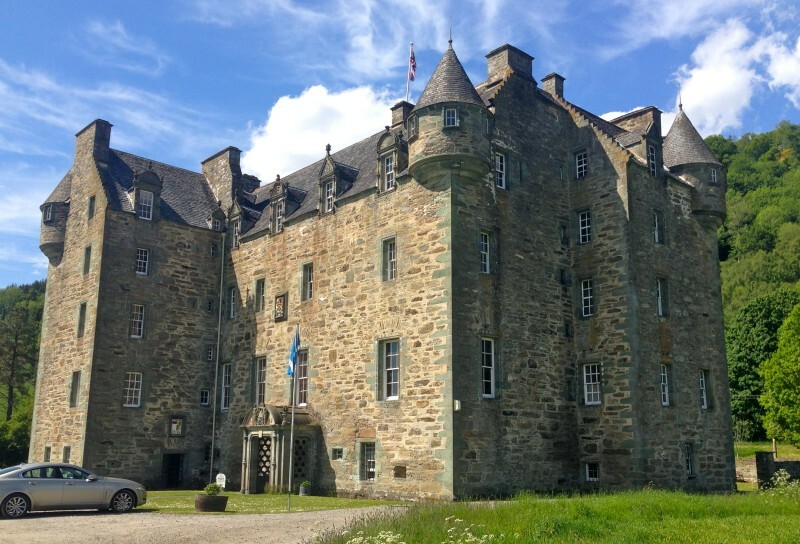 Castle Menzies enjoys an important role in Scottish history. It seems the area was first founded by St. Cuthbert who lived in a cave at Weem (Weem being the Scots word for cave). But as the Church grew and expanded so did the importance of the area and a proper castle was built on lands granted by the crown. In the Middle Ages it was a stronghold for Mary Queen of Scots and her supporters. 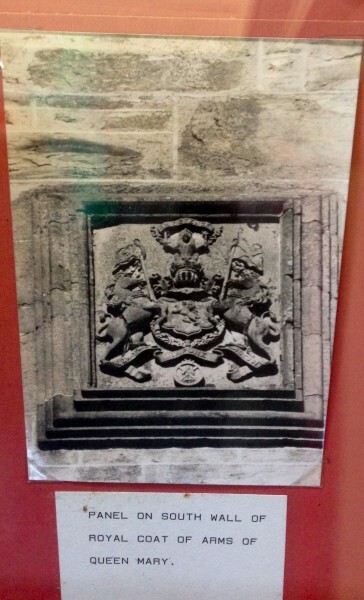 Her coat of arms is still on the Castle’s north wall. Here it is. Menzies Castle also houses some rare artifacts of Bonnie Prince Charlie, such as the bed he slept in prior to the Battle of Culloden. Many speculate that this must have been the ‘last peaceful night’s sleep of the Young Pretender’ on Scottish soil. After he left Castle Menzies, he was utterly defeated at Culloden and became a fugative on the run going first to Skye and then onto Uist before escaping to France. 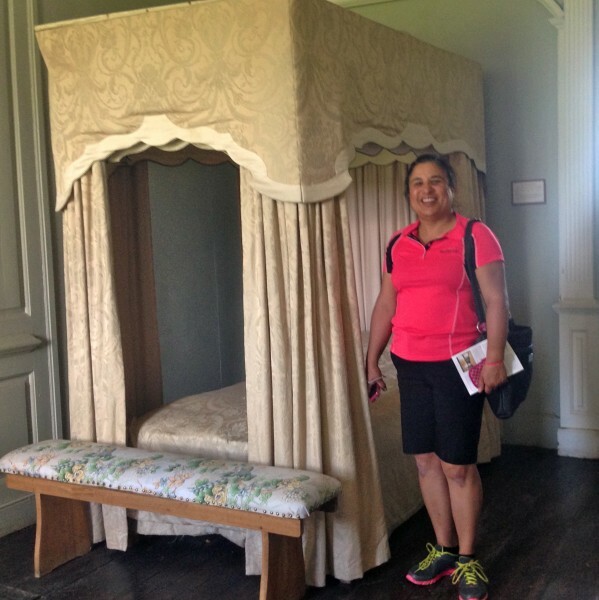 This is the bed he slept in and it is still on display.... Ann was tired but I wouldn’t let her climb in! There was another interesting display about Archibald Menzies an important figure in Scotland from 1754-1842. He grew up in Weem and in the Castle gardens where he gained an interest in botany. He went on to join the Royal Navy and became an explorer first going to Nova Scotia, and then in 1790 joining the expedition of Discovery around the world. He is responsible for introducing many of the original species of trees into Scotland and Britain upon his return. These include common trees we know of today such as the Sitka Spruce, the Monkey Puzzle Tree and the Madrona. They were all brought back from the Pacific Northwest where I was born, to Scotland, and over a hundred species of plants are credited with his introduction to our island. So after learning about all this important botany, we had to take a drive through to Kenmore past the oak trees planted by Queen Victoria to enhance the route from Taymouth Castle to Castle Menzies. Apparently she found the road too bare the first time she passed it on her visit to Scotland. 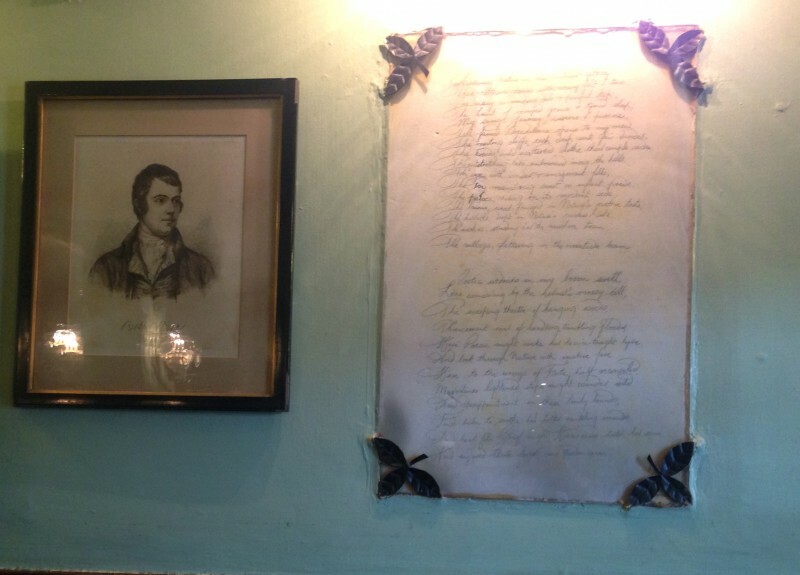 Our next stop was to the Kenmore Hotel where Robbie Burns penned his wonderful poem about Aberfeldy. I was loathe to sit in the corner beside the fire as I could picture the Bard hard at work penning his lastest masterpiece. 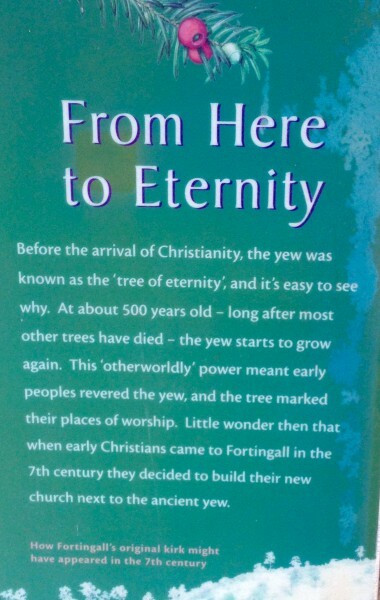 And yet this magnificent day would have been incomplete had we not seen the oldest tree in Scotland: the Fortingall Yew tree. We past the sign, and there was no way to avoid the detour, especially given all we had learned about the trees in Scotland! 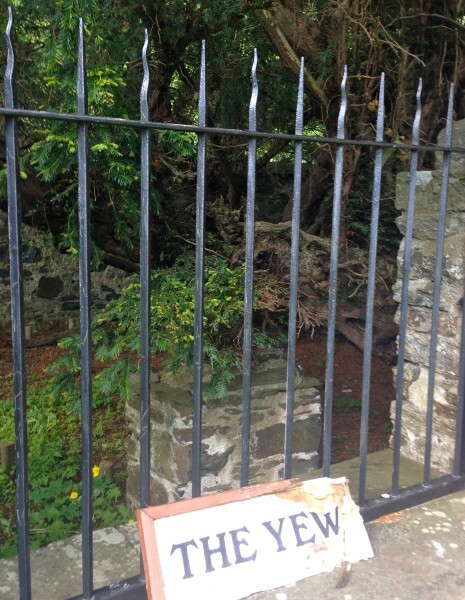 There are some 1000 year old Yew trees at Traquair House in the Scottish Borders, and this one here in Fortingall is carbon dated to be 5000 years old!!!! Utterly amazing. Yes, you guessed it! A great cafe latte on the banks of Loch Tay at Kenmore. Pure dead brilliant! 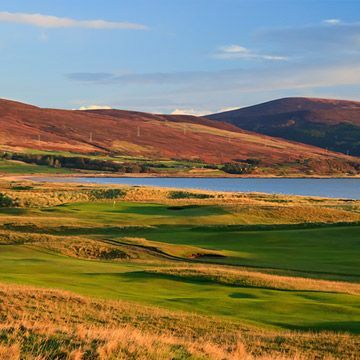 This ‘Lady of the Links’ had found another amazing gem in the heart of Scotland...it's a diamond that will glow in her heart for many days and years to come. 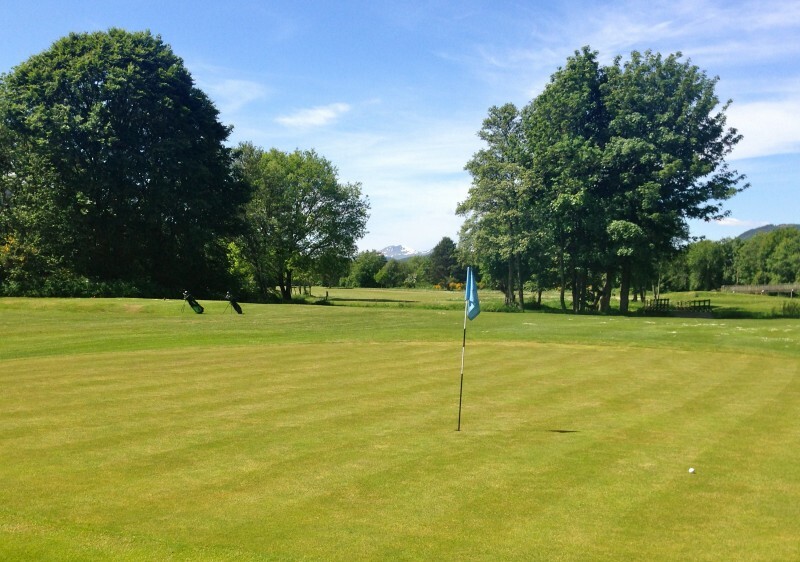 Footnotes: Aberfeldy Golf Club is 5014 yards with a par of 70. Men and Ladies play from the same tees, the yellow. It is a flat course that is easily walkable. Pull carts are available for hire but no golf buggies are on offer. The course can be shut due to flooding by the river or snow in the winter, but when the course is open and it readily welcomes visitors. The some of the greens this year are not particularly good, but it has been a very harsh winter in the glens. The recent conditions of rain and sunshine should have benefited them enormously.